This is continuation to Part 94, Please watch Part 94 from the ASP.NET MVC tutorial before proceeding with this video. We will continue with the example that we discussed in Part 94. 1. 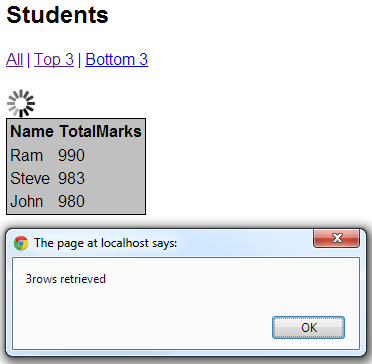 When you click on "All" link, all the students will be loaded into the <div> element that has got id=divStudents. 2. At the moment, when you click on "Top 3" link, the data from the previous request is still present in "divStudents". Only when "Top 3" students become available, "divStudents" is updated with new data. 3. Our application requirement is to clear, "divStudents" element content, as soon as we click on any AJAX link and before the associated action method is invoked. To achieve this, let's use "OnBegin" property of AjaxOptions class. Step 2: Associate ClearResults() function with "OnBegin" property of AjaxOptions class. To achieve this, let's use "OnSuccess" property of AjaxOptions class. Step 3: Associate CountRows() function with "OnSuccess" property of AjaxOptions class.